You are here:Home » Product Reviews » Molton Brown Review + DestinAsian Contest! I’d received a package containing Molton Brown “tender is the night” air constellation set (S$165); courtesy of DestinAsian, a classy travel & lifestyle magazine about Asia, featuring the latest in travel trends & marvellous destinations. Relaxing Yan Zhi Candela: Relax with this rich, spicy aroma of Indian ginger, tangerine & cedarwood. Re-charge Black Pepper Candela: This spicy fusion of Madagascan black pepper makes this luxury scented candle ideal for your home. Heavenly Gingerlily Candela: Let this heavenly candela relaxes you with a sensual blend of Indian tuberose, ginger etc aroma. Rose Granati Candela: Create a warm, exotic feel with this shimmering blend of spicy ginger, cardamom, nutmeg etc from Haiti. Naran Ji Candela: This luxurious scented candle fragrances your space with zesty aromas of orange, Egyptian basil, Russian carvi etc. With these candles, guess I’ll make some time to revitalize & rejuvenate my senses. 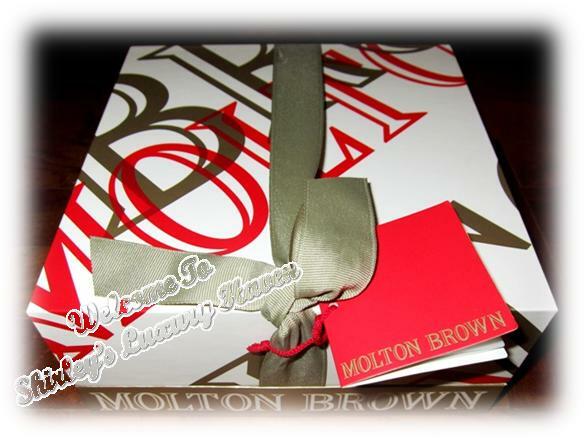 Wanna win some Molton Brown products? Hop over to DestinAsian now & stand a chance to win 2 Molton Brown gift sets worth at least S$100 each! Hurry, contest ends 24 Sept 2011! Good luck! Sounds good.. i want this product!! Kim, thks for visiting & remember to participate! i love aroma therapy.I use quite a bit of oil form which finishes very fast, i think this should be a good alternative. What a cute pup and her name is perfect with the tiara! :) I burn candles all the time and love their ambience, too. Will check out this giveaway (thank you, Shirley) because that Black Pepper candle sounds wonderful -- ALL of them do! This is so awesome, have some relaxing time with the fragrance. I wish I could smell these through my computer screen! And oh, your pup is just sooo adorable! Love her little tiara, she is indeed such a princess! 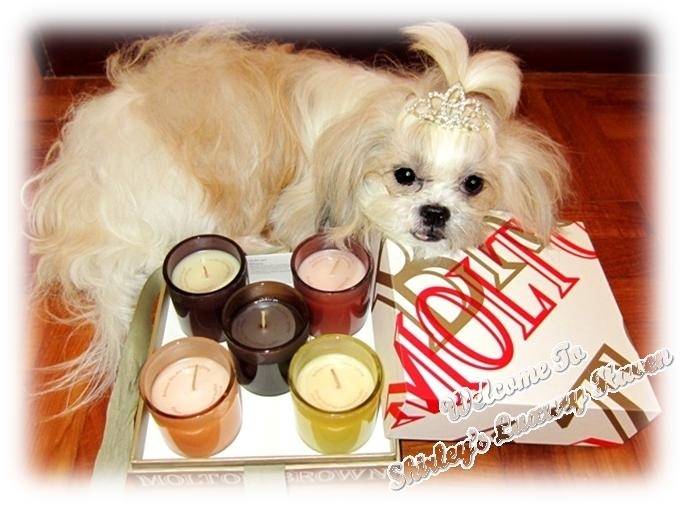 It seems that Princess Candy loves the scent of the candles! I guess they really smell good hah! :) Thanks for sharing this! I'll definitely check the giveaway! Kimby, Candy will be pleased to hear that :) I'm keeping the Black Pepper for hubby cause he likes Black Pepper Steak. Hahaha! Oops! Nava, perfect timing cause my shoulders are aching. Time to indulge in some aromatherapy. Peggy, break the screen! Hahaha! Enjoy your weekend, dear! Wi, I'm using Green Tea oil for my room's diffuser. Love the scent too! Princess Candy just got herself a modelling assignment. Heehee! she wants it all. LOL! U r so lucky to have the candles, the frangrance will last for months. I love to put this in my display cabinet. Biren, these candles have a very unique blend of scent :) Hahaha!, Candy sure knows what's good. Jen, isn't a waste to put them inside the display cabinet? Can see but can't smell. LOL! Your Little Princess is too cute! She surely knows good products when she smells it. What a great package to receive, Shirley. Laura, thks for visiting & I'll pop by your blog soon! Lequan, hahaha! Glad to see u back in action :) Will introduce Candy to u the next time u're in S'pore. EH, aren't you going to say nice dog too?? Heehee!